As the highest point in the Great Smoky Mountains National Park and in Tennessee, Clingmans Dome towers at 6,643 feet tall. 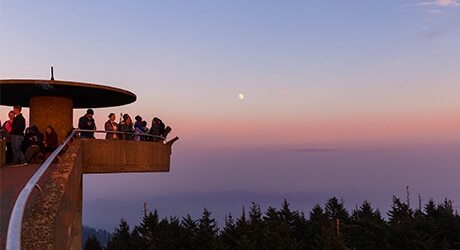 Located along the state-line ridge, Clingmans Dome is a popular park destination. Situated on a summit, the observation tower offers stunningly expansive views of the Smoky Mountains as far as the eye can see. Those who make their way to the top are awarded with panoramic 360-degree views of one of the largest protected areas of land in the eastern United States. Views from the top of the observation tower are spectacular when days are clear. The view can expand over 100 miles in every direction and into seven states. When settlers first arrived, they nicknamed Clingmans Dome the “Smoky Dome” since the summit was often covered in clouds and shaped like a dome. It was renamed after U.S. Senator and Confederate general, Thomas Lanier Clingmans, explored these mountains and became the first person to accurately measure the height of the peak. To get to the dome you turn on Newfound Gap Road just south of the Newfound Gap and venture seven miles along Clingmans Dome Road where you will find a half-mile trail and large parking area. This paved trail leads you to the 54-foot observation tower. Along your journey to the dome, there are lots of scenic areas to pull to the side to get endless views of the ridges and valleys scattered throughout the park. If you wish to soak in nature’s gift, there are several hiking trails that lead to Clingmans Dome. The Appalachian Trail intersects with Clingmans Dome and is one of the more popular trails to explore in the park. 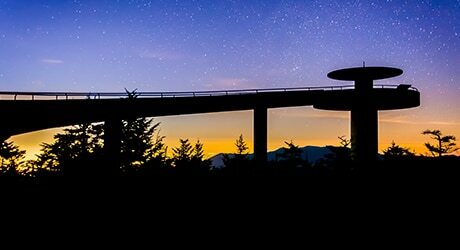 Clingmans Dome is open year-round, but the road leading to it is closed temporarily December 1st through March 31st. For your safety, the road also closes whenever weather conditions require.